Return to the beginning where the opening game trailer ended. Joker muses to the dead Harley Quinn how he always thought killing Batman would create an inner fanfare, fireworks, or a hallelujah chorus. He gently closes her eyes and disappears as soon as the swarm of exobytes reigns down on Metropolis. Days pass while Batman's body lay amidst the rubble and carnage of what's left of the city, until he is discovered alive by two new heroes named Allyce and Fracture. They decide to bring him back to someone named Cyber who leads a whole group of Superheroes infused with leftover exobytes from Brainiac's initial onslaught (It's not explained here, but I'm 99% sure that this is the case). Cyber refits Batman with cybernetic "promethium-based" appendages - including his right arm - to replace the bones that have been nearly liquefied. After several days of recovery, the group is attacked by Brainiac's robots just as Batman wakes up. They are completely overrun, so Fracture grabs Batman and Cyber to escape. After Batman commands it, they make it to the Fortress of Solitude in the Antarctic. Lex Luthor's DNA would trip the circuits in the Fortress, but Batman's was officially designated to take control in such a catastrophe. Thanks to his newfound cybernetics, Batman is able to interface directly with the Fortress's computers to find a weakness in Brainiac's defenses. But Luthor understood this years ago and specifically planned for Batman to infiltrate Superman's Fortress of Solitude and allow him the access that he needed. 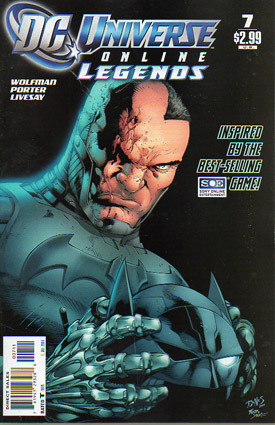 While Batman was under the knife with the group of superhumans, Luthor planned this whole scenario out and relies on Batman to gain access to the Fortress and its time displacement equipment. The BIG REVEAL is that Luthor is responsible for these new heroes and they are in league with him. Cyber contacts Luthor to fill him in on these developments while Lex looks for Brainiac on the ship during the last issue. Batman sees everything unfold on Brainiac's ship, but fails to see how his new compatriots are in league with Luthor. He contacts all the League but Luthor picks up Atom's JLA communicator as shown in the previous issue. Luthor answers the call and, as expected, hears that he should teleport to the Fortress. After making sure Batman relinquishes Lex's DNA pattern so the Fortress won't immediately attack him, he arrives to take the canister of exobytes to the present where he will be able to introduce meta-human powers to the populace and take on Brainiac in the present. Batman holds off Brainiac's attacking machines that have infiltrated the Fortress of Solitude while Lex Luthor makes his way back in time to warn and help the Justice League of the past. Story - 4: This is an awesome not-quite-turn of events where we learn how Batman survived the initial villain onslaught from the opening video. The new characters have played their respective roles, but it's still clear that their existence needs to be explained either in the comic or the game itself. I'll take this opportunity to say that I have not continued following the story of the game, but intend to - once the Playstation Network has been fixed - These new characters appear to be synonymous with those created within the context of the game. Due to the lag in Playstation Network updates from the hackers that appropriated material from players last month, here's hoping that the comic can catch up with the game itself and players can read both in tandem. Although it's clear that this is meant to take place just before the first official game update there are certain forgivable inconsistencies that should be addressed. "Fracture" looks nothing this his comic book counterpart and some simple communication could have alleviated that. Art - 3: The art has hardly been improved since the last issue. Again, it's not bad, but not at all up to par with what ought to be expected from a series that is CGI-based. In the final pages, Batman does not look at all dynamic taking on Brainiac's robots. Cover Art - 4: This looks great with the simple black background with a blue glow from the side. Obviously Batman looks different and has been severely injured, but from the look in his eye, his resolve has never weakened. That's what should be expected from Batman and it's exactly what we get. From the story, Batman's arm was replaced with a cybernetic one and it looks amazing here.